I wanted to let any potential C4 attendees know that I’ll be attending the indie Mac developer conference next week. If anyone would like to get together for drinks or dinner that weekend, shoot me an e-mail and I’ll see about getting something arranged. Likewise, you can keep an eye open for me at the conference. I’d be particularly interested in talking to any developers who might be interested in taking their apps and making them context-aware. Posted by admin at 3:09 pm on August 29, 2008 . Filed under Meta. The Group Context Widget: Wanna play? Lately, I’ve spent a great deal of space blogging about development of the Pennyworth context-sensing system. I want to blog about something a bit different today: a Pennyworth application. One of my research goals is to investigate the effects of introducing context-sensing technology in environments such as the modern workplace. On one hand, there are likely some potential positive benefits, such as allowing coworkers to monitor each others’ availability in order to minimize interruptions. On the other hand, there will be some potential downsides, such as an overbearing manager using the technology to try and re-implement a twisted version of Scientific Management in the office. 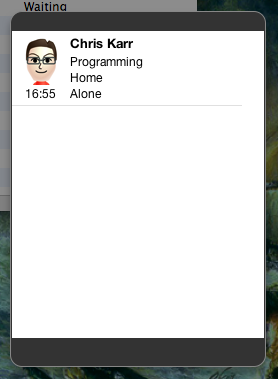 Currently, the widget looks pretty lonely as I’m the only one logging context at the moment. As more people participate, the more this will fill up and become more interesting. I’d like to invite any interested readers to explore this with me. I’m planning on keeping this somewhat private, so if you’d like to view others’ contexts, you must participate in turn. If you decide to join this virtual group, you should send me (via e-mail) the name you would like to use in the display (a pseudonym is fine) and an icon to represent you. In return, I’ll send you a small Pennyworth action script that will log your context to the web service and a copy of the Dashboard widget in addition to pointers to TOP SECRET URLs that implement some of the other views I mentioned above. You must have a running instance of Pennyworth to participate and you can choose to withdraw from this at any time. If you are also uncomfortable logging particular context details, I’ll be happy to help you modify the action script to exclude or mask those details. Update: I fixed the e-mail link. Sorry about that. Posted by admin at 4:47 pm on August 28, 2008 . Filed under Meta,Pennyworth. Pennyworth Punch Clock 1.0b4 is now available for download. Posted by admin at 10:01 am on August 26, 2008 . Filed under Pennyworth Punch Clock. Pennyworth 1.5 is now available for download. 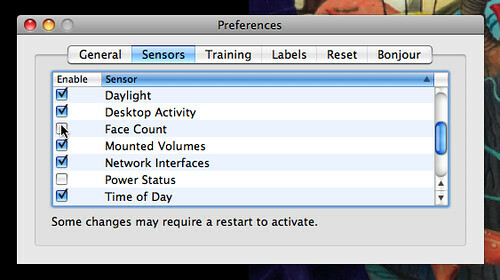 This update fixes a variety of bugs and adds support for a new idle time sensor. This release addresses application hangs caused by badly behaving AppleScripts and supports individual Growl notifications for individual context aspects (activity, location, social context). Posted by admin at 9:51 am on . Filed under Pennyworth. Pennyworth 1.4 is now available for download. Posted by admin at 12:52 pm on August 15, 2008 . Filed under Pennyworth.